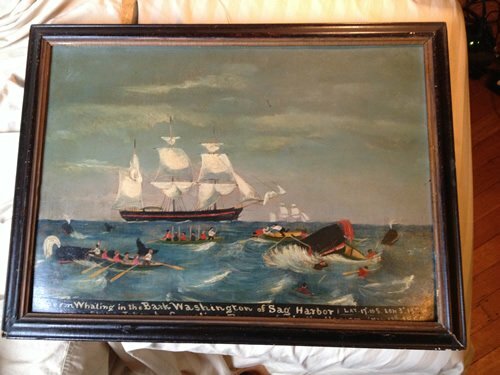 On September 29, 2015, FBI New York’s Art Crime Team returned the Bark Washington painting to the Oysterponds Historical Society in Orient, New York, after it was stolen more than 14 years ago. Orient, NY - October 1, 2015 - On September 29, 2015, FBI New York’s Art Crime Team returned the Bark Washington painting to the Oysterponds Historical Society in Orient, New York, after it was stolen more than 14 years ago. The FBI presented the painting to Amy Kasuga Folk, Manager of Collections, and John Holzafel, Interim Director at the Oysterponds Historical Society. The Oysterponds Historical Society reported stolen in March 2001 the Bark Washington painting, Jennie French Potter painting, and two whale busks. The thief was never identified and the case remains open. The return of the Bark Washington painting was made possible by an individual who bought the painting at an antique shop in East Marion, New York in 2001 for a few hundred dollars. One day he decided to look up the painting on the FBI’s Stolen Art Database and discovered it was stolen. He then contacted the FBI, generously agreeing to return it to the rightful owner. Several stolen items remain at large. Anyone with information on the painting entitled Jennie French Potter by Samual F. Badger or the whale busks, is asked to call the FBI’s Art Crime Team at (212) 384-1000 or submit a tip here. Tipsters may remain anonymous. Subject: LongIsland.com - Your Name sent you Article details of "FBI New York Facilitates Return of Stolen Painting to Oysterponds Historical Society, Seeks Public Assistance Locating Other Stolen Items"